I'll absolutely take you up on this. Now to figure out how. 100% in for this. I was originally gonna push for MC Skat Kat, but really I think I'd kill either part TBH. You've shocked me. I can't say I'm disappointed (delighted, really) but a huge part of me did want to hear you scream "THERE'S NOTHING INSIDE." @Boots does your version of Opposites Attract have the rap? This is vital information in deciding whether I rock paper scissors Jack to be the cat (I cannot rap). I hope there's some Blondie in the karaoke lineup. 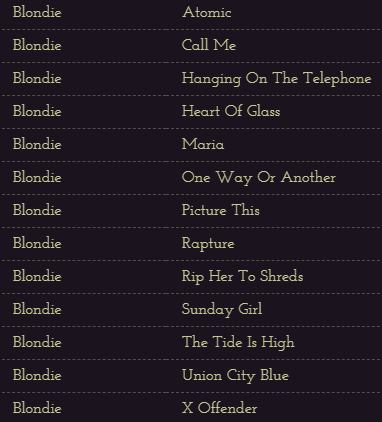 I love Blondie and making an idiot out of myself. The relationships ending were not directly related to the f plus shows, sadly, I just had two bad relationships that happened to be with people who did not enjoy the dramatic reenactions of Internet morons that the good people of the f plus provide. The stories are not fun sadly. Just passive aggression about me liking that ‘dumb show’ and/or me getting sloshed at the show and bad times happening on the way home. As happens. As for the wife I will not even try. I am sufficiently superstitious now. Uh uh, f plus, you are not taking this from me, you questionably british-sounding sirens. If your wife finds out you went to this show and gets annoyed that she wasn't invited, then you have found a keeper! Hey, my +1 just pointed out this is technically occurring on Halloween weekend. How encouraged are costumes and general Halloween celebratory practices? We're curious to know. people in costumes? that would be ridiculist! Be careful what you wish for, Shell. Hey, are there any ballp.it approved places to stay in Seattle? I'm thinking of arriving a day or two early because their science museum has an archive collection I want to look at. I very, very much hate doing this, but some stuff came up in my living situation which might require me to not be able to make it up to Seattle. If so, is there an approved way to sell my ticket at face value to someone else?